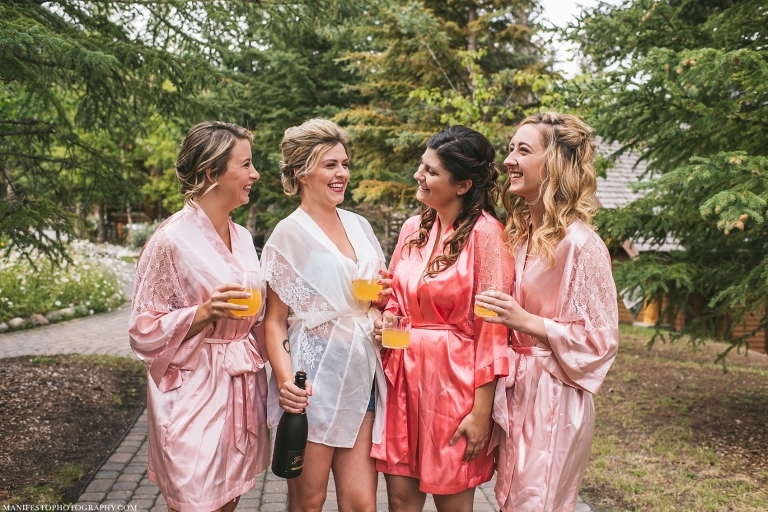 Last summer we had the honour of photographing Jared & Nicole’s intimate wedding in Banff, Alberta. Their wedding was a little extra special to us because Jared is the brother of one of our lead photographers, Joshua! Not only did we get to spend a week away with family, but we were surrounded by the most beautiful sites and sounds that Canada has to offer. Nicole started her morning off with her best gal pals at The Hair Company getting primped and pampered (a rare treat for her, as a hairstylist)! 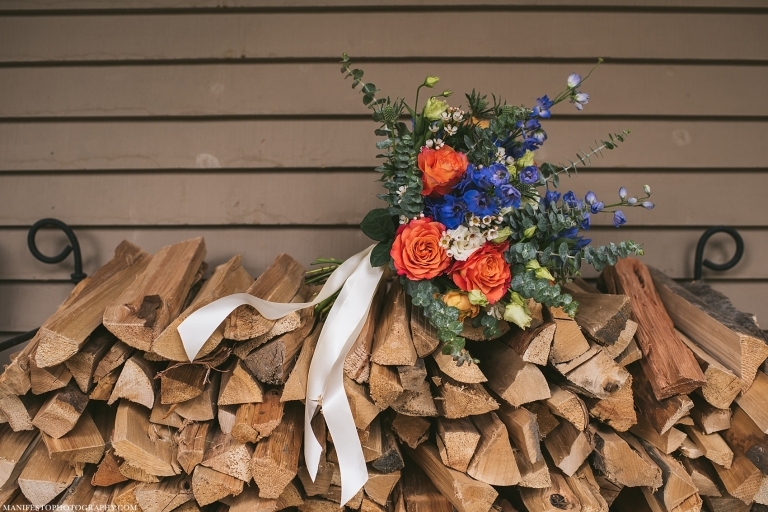 Everything came together wonderfully, from her wildflower bouquet from Willow Flower Co., to her open back dress from It’s Your Day Bridal. The ladies headed back to their hotel at Buffalo Mountain Lodge for a special ‘first look’ with Nicole and her dad. It was such an adorable and emotional moment (scroll down to see dad’s reaction)! From there the two joined the rest of the wedding party and headed towards the ceremony. It was there at the Tunnel Mountain Reservoir beside a staggering mountain range, Jared and Nicole said I do and took their first steps (errr, dance moves!) as husband and wife. Shortly afterward, some wicked storm clouds rolled in and threatened rain for their wedding party formals. Thankfully, it only poured briefly and we got as lucky as any photographers could be with a gorgeous rainbow! 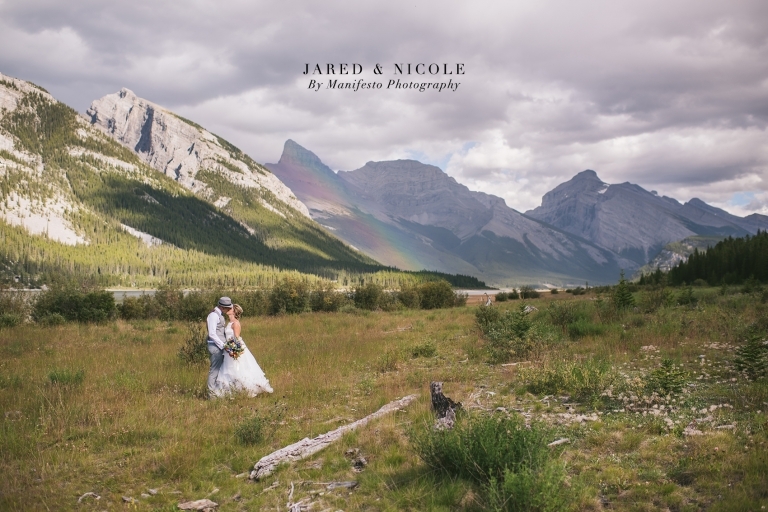 Jared and Nicole are the king and queen of living in the moment and are always up for a random good time, so when we said “hurry, run over there so we can get that rainbow!” they bolted across the field in their wedding clothes laughing and smiling. It was a good thing they did too because that rainbow lasted only a minute or two.